UDA Land (North) Sdn Bhd plans to launch a RM650mil condominium project on a leasehold site in Tanjung Tokong in the first quarter of next year in view of the strong demand for high-rise residence in prime locations and the changed perception towards leasehold properties among Penangites. UDA Land chief operating officer Kamarudzaman Mohd Zain says in an interview that the project, Darra, located by the sea will comprise condominiums with built-up areas ranging between 1,400 sq ft and 1,800 sq ft and are priced above RM800,000. “The layout plan is in the final stages of approval. The project is expected to be launched in the first quarter of 2013,” he says. Kamarudzaman says that with the right pricing residential properties located in prime locations are still selling very well. “For example, Brezza, comprising 312 condominium units of between 1,250 sq ft and 1,450 sq ft in the same location as Darra, was sold out in a year to mainly local buyers. “The selling price in the sub-sales market for Brezza units has appreciated to about RM700,000 from the initial pricing of between RM350,000 and RM500,000 per unit in late 2010,” he says. The demand for commercial properties in the right location is still strong, despite a slowing economy with an anticipated GDP of 4.6%, compared to over 5% in 2011. The Vantage Desiran Tanjung, comprising a four-story business centre with 120 units of shop office, although 80% completed, is already 100% sold. The price for a standard ground floor unit is around RM1.2mil. The units on the higher floors are priced lower. “The RM87mil Vantage Desiran Tanjung sold well because of its broadband facilities, ample car park bays. The project's proximity to a hospital, international hotels, botanical gardens, and renowned project Straits Quay mall in Tanjung Tokong were plus points,” he says. Registered and chartered valuer C.A. Lim & Co proprietor Lim Chien Aun says the value of properties on leasehold land in the island has appreciated substantially. This shows that Penangites, who have always been reluctant to invest in leasehold properties, have changed. “Leasehold properties in prime locations are now appreciating faster than freehold properties in a non-prime location. Actually, the leaseholds in neighbouring countries have appreciated very well. For example, the land in Hong Kong island is leasehold and yet the value of properties on the island is among the highest in Asia. “A lot of the land in central London, for example, is leasehold too, but the value of property is very high,” he says. Raine & Horne Malaysia director Micahel Geh says Penangites now give more importance to the location of the property rather than to the status of the land on which it sits. “They are now looking for conveniences and amenities like easy access to shopping malls, food and beverage outlets, banks, cinemas, and hospitals. “Some of the leasehold projects on prime locations in the island have been appreciating at over 10% per annum over the past two years,” he adds. In Seberang Prai, UDA Land plans to launch a RM33mil four-storey commercial mall come end of 2012, known as TPJ Business Park, in Jalan Baru, a prime location. “The mall will have about 8,500 sq m of gross built-up area that can accommodate 76 commercial lots of 1,160 sq ft and 2,100 sq ft. We are planning more commercial projects on our remaining land bank of about 20 acres. These commercial schemes are to support the needs of the residential community in Seberang Prai,” he says. Kamarudzaman says UDA Land also plans to submit the building plan for the RM98mil Serambi project soon to the local authorities. The project, which is on a 16-acre site, comprises three-storey semi-detached, terrace, and bungalow units. “The plan for the project has received the green-light,” he adds. He says UDA Land will launch the RM22mil Arcaria project early next year. It comprises 26 units of three-story semi-detached, three-story super-linked, and bungalows. The terrace units will be priced from RM725,000 onwards, a semi-detached for about RM900,000, and bungalow units from RM1.4mil. 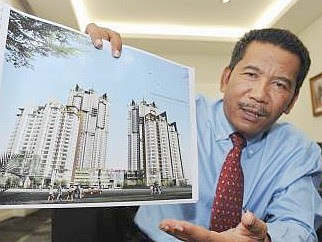 Meanwhile, Fook Tone Huat of Henry Butcher Seberang Prai says property prices in central Seberang Prai have appreciated by about 20% since 2010. “In prime locations of Seberang Prai, a semi-detached house is priced at about RM750,000. A terrace house in similar locations is now priced at about RM280,000, compared with about RM350,000 two years ago. Similarly, a bungalow has a price tag of RM1mil now, about 20% more than two years ago,” he says. The value of commercial properties in Seberang Prai has also appreciated by about 20% from 2010, Fook adds.